“Iceberg, right ahead…!” Those words were called out by lookout Fredrick Fleet at 11:40 p.m., April 14, 1912, shortly before the Titanic stuck the mountain of ice that would send it to the bottom of the North Atlantic three hours later. Where did the iceberg that fated the Titanic originate, and by what journey did it arrive in the Titanic’s path? The experts believe that it calved from the Jakobshavn Glacier in western Greenland, perhaps in September of 1910. During the next year and a half it floated into Disko Bay and into the West Greenland Current, where it moved northward, floating past the rugged shores of western Greenland, passed Thule, counterclockwise around Baffin Bay, and then southward along Baffin Island, through the Davis Strait, and into the Labrador Current. As it came close to the craggy coastline of southern Labrador and the southeastern shores of Newfoundland, it may very well have become grounded, not once but several times, as tidal forces waxed and waned. 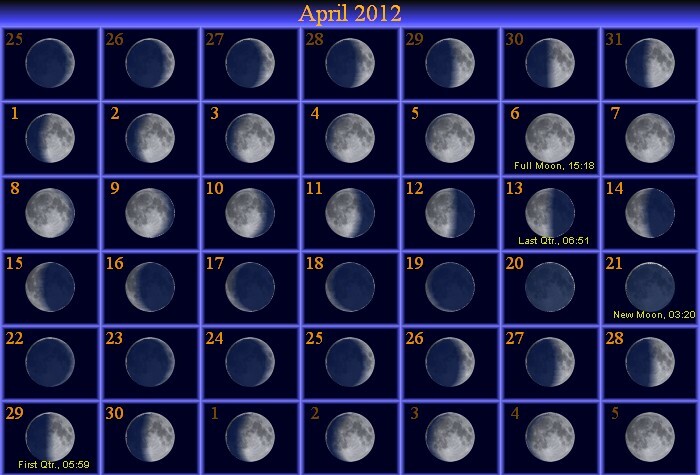 It is the moon that is responsible for the majority of the tidal effects that we experience. In fact, Luna is about 2.2 times more potent in raising the tides than the sun. As the Earth rotates underneath a slower moving moon, the oceans oscillate between high and low tides twice each day. Exceptionally high tides that could strand some icebergs and release others, called spring tides, occur when the moon is either new or full and the tidal forces of the moon pull in the same direction as the sun. Neap tides result when the moon and sun pull at right angles to each other dampening the tidal pull, causing lower high tides and higher low tides. East of St. John’s Newfoundland, the iceberg moved slowly but steadily south, then southeast into the North Atlantic and into the path of the doomed ship. Read the full story in the April issue of “Sky and Telescope,” available at places like Barns and Noble. Next week marks the centennial observance of the sinking of the Titanic. The White Star Line’s flag ship was on her maiden voyage from Southampton to New York when it struck an iceberg, April 14, shortly after 11:40 p.m. Just under three hours later, Titanic’s broken stern slipped into the 28-31 degree waters of the North Atlantic. Deaths totaled 1517. Less than half of that number lived (710). The last Titanic survivor died in 2009. Even though the night was moonless, lookouts Frederick Fleet and Reginald Lee should have been able to spot the iceberg from a greater distance then they did. They may have been fooled by a mirage that helped to obscure the ice until it was too late. The night was radiantly clear, the ocean calm with almost a glass like quality. Titanic was sailing under an immense dome of high pressure, having recently passed from the warmer Gulf Stream into the much colder Labrador Current. 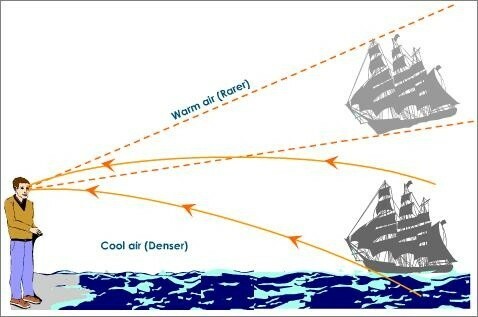 When the air becomes warmer with altitude, called an inversion, a mirage can occur that creates a false horizon, lifting it higher than the true horizon. The effect would have obscured the nearer ice against this hazy false horizon, rendering it invisible until Titanic was close enough to make the iceberg appear higher than the false horizon. By that time, 11:40 p.m., maneuvering the cumbersome ocean liner from its path of collision had come and gone. Other atmospheric high jinks may also have occurred. The SS California, about one hour away, spotted a distant Titanic lifted above the true horizon by the super refraction of the atmosphere. Because it appeared too small, it was not deemed to be the great ocean liner. The atmospheric inversion also garbled Morse lamp messages between the two ships, keeping the California from understanding the true nature of the disaster until well after the Titanic had sunk into the frigid Atlantic. During the past two weeks, eastern Pennsylvania has experienced a wave of crisp, dry, nearly cloudless days that have succumbed to nearly flawless nights. It has not been that way for New York State nor for areas south of the Mason-Dixon Line, but PA has been doing just fine. That’s given me plenty of time to set up my favorite telescope and mine the heavens for some of the better clusters and nebulae that can be seen from a suburban environment. And of course, the planets are still bountiful in the early evening hours. 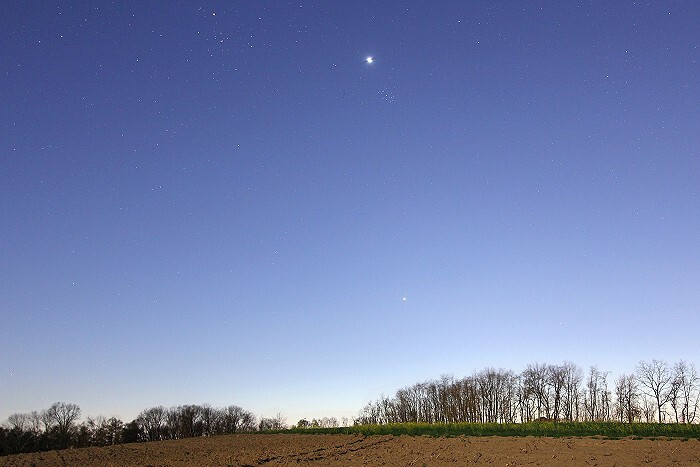 Jupiter is positioned very low in the west during dusk, to be lost in the sun’s glare by the end of next week. Venus in the west still dominates, but it is looking like a fat crescent through my telescope, which means that it is beginning to head back towards conjunction with the sun. By late dusk, pinkish Mars is nearly due south about two-thirds of the way up in the sky. The bright star to its right is Regulus of Leo the Lion. The sleeper of this story has been Saturn which has hung low in the southeast during the early evening hours, rendered invisible by the trees in my backyard. It has been rapidly gaining altitude during the past month. By late dusk, Saturn can be seen one third of the way up from the SE horizon, to the left of Virgo’s blue supergiant, Spica. To confirm this, simply follow the arc of the Big Dipper’s handle, now high in the NE after sundown. It will lead you past warm-toned Arcturus of Bootes the Bear Driver, then on to spike Spica. Meteor season also commences at the very beginning of next week. 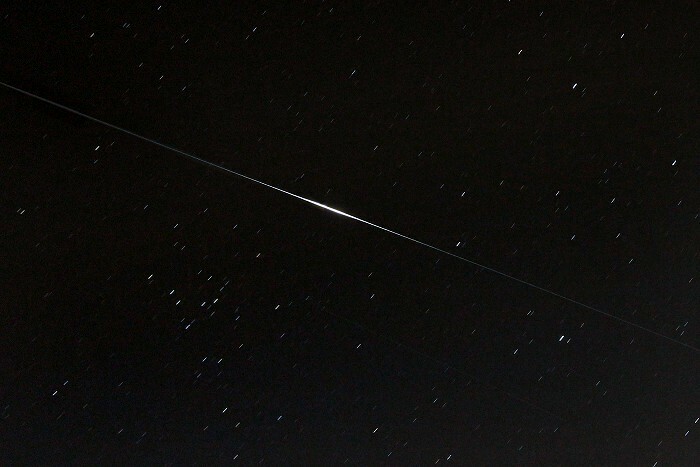 Lyrid meteors will be flying during the morning hours of Sunday, April 22. Dress for winter, and make sure you have a sleeping bag or bedroll for extra comfort. Face east after midnight and look for Vega just to the south of east, about three fists held at arm’s length above the horizon. Meteor rates will be about 10 events per hour from the suburbs. Good observing! During the past two months the moon has played among the planets—Venus, Mars, Jupiter, and Saturn, strung across the evening sky like glistening pearls. Round three for the moon is now upon us. On April 22, look just north of west for the thinnest of crescent moons positioned just three scant degrees above Jupiter. Your sunset horizon will have to be free from obstructions, and binoculars will always prove handy to find the pair as early as possible. Locate the brightest spot on the horizon and scan to the left of that position. If you’re watching about 40 minutes after sundown, the pair should look stunning through binoculars with plenty of earthshine to illuminate the vast portion of the moon not in direct sunlight. Earthshine is light from a nearly full Earth reflected back to us from the moon. It gives Luna a dusky appearance to the unaided eye, but through binoculars, the darker seas and brighter highlands, including craters, are revealed from just the spotlight of a bright Earth shining onto the moon’s surface. If you miss the final embrace of Jupiter and the moon on Sunday, do not fret. 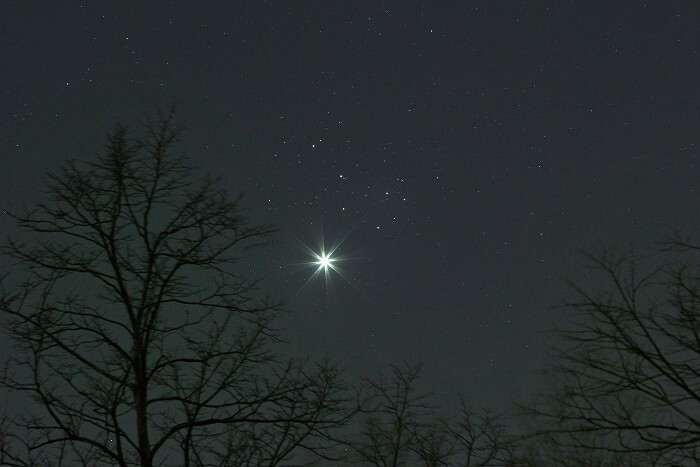 The moon is on the prowl, and its next target, Venus, the third brightest celestial object, is in plain sight. On April 23, Luna is 14 degrees below the Goddess of Beauty, but the following two evenings as the waxing crescent moon brightens, the separation is only six degrees and 11 degrees respectively. The next planet on the moon’s journey, Mars, will take five days to reach, and by that time, April 30, the bright gibbous moon will be passing below the Red Planet. Finally, Luna’s trek across the heaven ends with a fat waxing gibbous moon approaching Saturn on May 3. It will be nearly 15 degrees from the Ringed World. By the next day the moon has just passed Saturn and is on its way to its full phase on May 5, having completed its third cycle of passing all four planets in the evening sky. Not since 1994 has there been a central eclipse of the sun that has crossed an area of the United States. 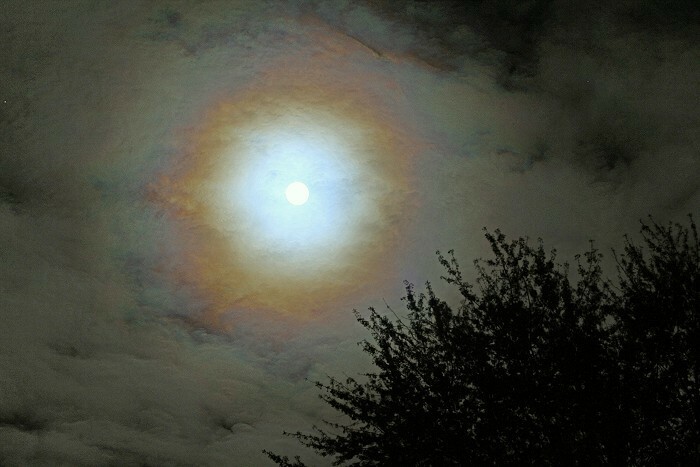 The morning event was an annular eclipse, where a ring of sun appeared around the moon during centrality. I saw it from Texas with students on May 10, 1994. On Sunday, May 20, the continental US from Crescent City, CA to Sundown, TX will be lined up for another central event, and again the moon will be too small to cover the sun completely. A ring of fire will surround the moon for over four minutes. These two eclipses are related by an 18 year, 10 or 11 day beat called the saros. Again, the moon will be too far away from Earth to cover the sun completely, a consequence of the egg-shaped orbits of the Earth and the moon which are continuously changing their distances. 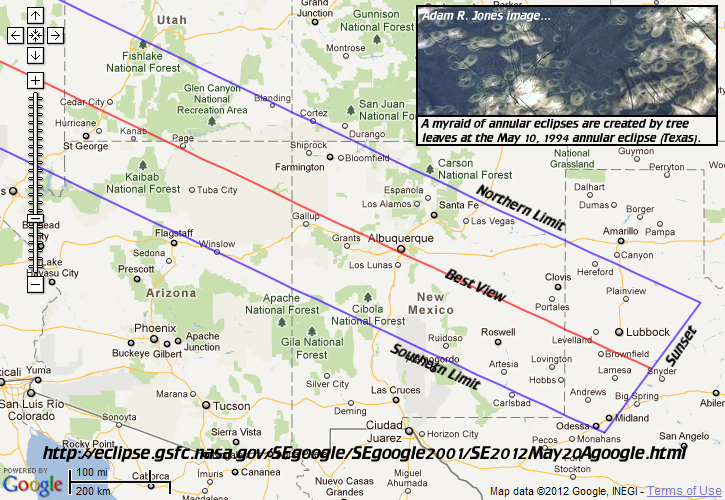 What makes this eclipse interesting is that it will be occurring very near to sunset. Mid-eclipse sun altitudes range from nearly 22 degrees on the California coast to the Texas horizon just south of oil rich Sundown. 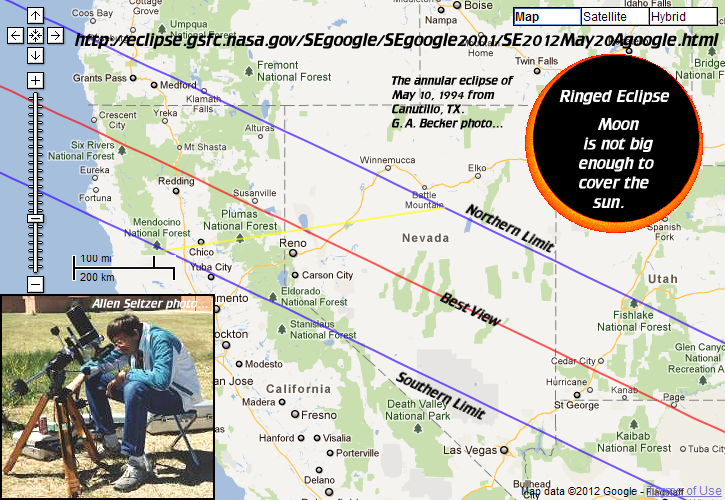 Near horizon solar eclipses have the benefit of capturing Earth and sky if lighting conditions are subdued enough. On the other hand, partly cloudy conditions will always produce the greatest percentage of overcast nearest to the observer’s horizon where the clouds seem to stack up one upon the other. So a nearly flawless sky will be the most important consideration. This may require choosing several sites to ensure favorable weather. If you are looking for National Parks to visit, consider Red Wood, Lassen, Zion, Bryce Canyon, Grand Canyon, Glen Canyon, Canyon De Chelly, Chaco Canyon, and El Malpais. Towns that have good vantage points are Crescent City, CA; Reno, NV; Page, AZ; Albuquerque and Santa Fe, NM; Lubbock and Midland, TX. Better yet, check the NASA website http://eclipse.gsfc.nasa.gov/SEgoogle/SEgoogle2001/SE2012May20Agoogle.html for an interactive map to see it all.